Cryptomundo » What Does The Press Overseas Think Of Bigfoot And The People Who Search For Them? Initially I thought that way, but after reading some press about the show this morning I know wonder if the whole thing may be yet another program that plays off the belief that Sasquatch is nothing more than a giant hoax perpetrated by rednecks, the slow minded, those seeking fame, and people that live in trailer parks. I hope my impression is wrong, but as I said before, the latest press coming out of the UK has me concerned. A BBC Four documentary is to look into the “culture of Bigfoot hunting”. Shooting Bigfoot: America’s Monster Hunters will follow filmmaker Morgan Matthews as he accompanies three American Bigfoot search parties on the lookout for proof of the elusive missing link. Tom Biscardi is one of the men Matthews tails. He has been hunting down the ape-like creature for 37 years (some would probably take a hint after 5 years so extra credit for persistence), turning his hobby into a career. His website (which is quite something, check out the hilarious Bigfoot Photoshop job at the top) lists him as CEO of Searching for Bigfoot inc. He and his team “adopts a military approach” to finding the creature, utilising thermal imaging cameras and tasers as part of their ever-increasing arsenal. Two more hunters, Dallas and Wayne from Ohio – are unemployed and think Native American chanting will help them lure Bigfoot. The success rates of each are the same. 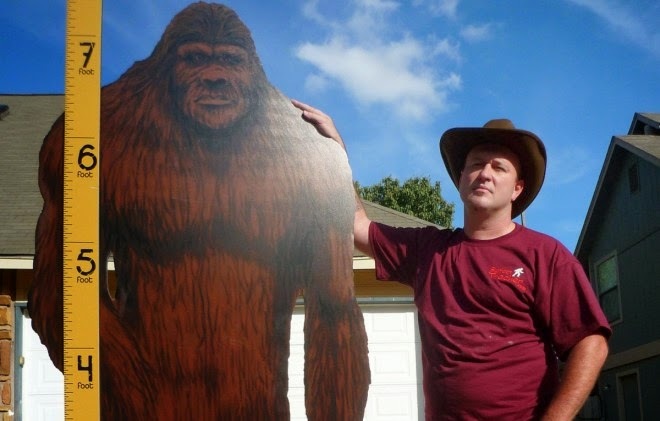 Finally there’s Rick Dyer, who found fame earlier this year for allegedly killing Bigfoot in 2012 and posting pictures of the “beast” online. Shooting Bigfoot: America’s Monster Hunters airs Monday 24 March at 9pm. This entry was posted on Friday, March 28th, 2014 at 11:07 am and is filed under Bigfoot, Bigfoot Hunter, Cryptozoologists, Cryptozoology, Men in Cryptozoology, Monster Island News, Pop Culture, Sasquatch, Television. You can follow responses via our RSS 2.0 feed. You can skip to the end and leave a response. Pinging is not allowed. I’m pretty sure your view is well within the ball park. And now we have ‘Shooting Bigfoot’. That’s not going to help much.